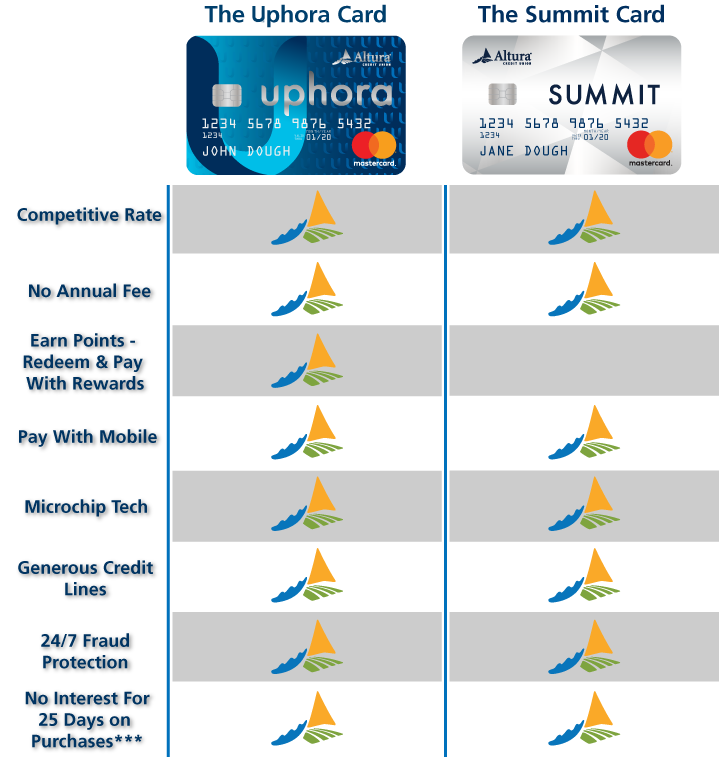 Between our uphora Rewards Card and Summit Non-Rewards Card, our Members have the flexibility that comes from competitive rates and great features. uphora comes with MasterCard Rewards, which allows you to earn points and redeem them for merchandise, cash back, gift cards, travel features including Pay with Rewards. 24/7 fraud protection tracking to keep an eye out for unusual (and suspicious) activity. Account Alerts to help you manage your credit account. Choose either email or text delivery. Pay with reward points using MasterCard Rewards or get cash back. Keep track of your reward points in real time through the MasterCard Rewards App. Get auto rental coverage for damage, collision and theft. Buy with confidence – our cards offer extended warranty coverage. The Summit Card is perfect for balance transfers and for Members who tend to carry a higher monthly balance and whose focus is really on the rate. Click here for full rate information. Perfect for high balance transfers. Buy with confidence – our cards offer extended warranty coverage. If you previously had a credit card with Visterra, you may reach 800-234-5354 for service or visit https://alturacu.mycardinfo.com/ to log into your account. *Anywhere MasterCard is accepted. ”Spend and Get” promotional offer valid for 90 days from the ﬁrst transaction. Eligible Transactions: Transaction Types Purchases and Returns (Refer to MasterCard Rewards Disclosure 5 and 6), Transactions that accrue base points. When the cumulative spend on a card is greater than or equal to $2,000 and meeting the above criteria, a one-time adjustment for 20,000 points will be awarded. All loans are subject to credit approval. Membership eligibility required. Other restrictions may apply. For full disclosure and program details visit www.Alturacu.com/uphora © 2017 MasterCard. MasterCard, MasterCard Pay with Rewards and the MasterCard Brand Mark are registered trademarks of MasterCard International Incorporated. Interests rates are variable and may change without notice. **APR = Annual Percentage Rate. Rates are subject to change without notice. ***On approved credit. Not all Members will qualify.